This setup guide is a walk through of the steps involved in obtaining the best possible results from ripping Audio CDs using dBpoweramp CD Ripper. Re-reading: more often than not errors will change each time they are read, then can be detected and recovered by reading multiple times. Non-secure ripping mode, often referred to as burst is employed by programs such as Windows Media Player, or iTunes. These programs will not indicate your rip has errors. This is where the real 'work' begins, effort put in at this stage will ensure best possible results - we have a saying 'rip once - rip right', ripping is a time consuming process, it should be only done once to create perfect, verified results. Decide on an audio format, preferably a lossless audio format (a file compressed with a lossless encoder will decompress 100% identical to the source file). Popular audio formats are FLAC and Apple Lossless. The choice of audio format depends on the programs used for playback: iTunes prefers Apple Lossless and practically all other programs prefer FLAC. This guide will continue with FLAC as its codec of choice. Rip To audio encoder defaults to	FLAC. Lossless audio codecs do not have many options, all compression modes are lossless, the higher modes require much more CPU encoding time and will only achieve an extra 1% compression. For FLAC Level 5 is a good selection (a good balance between minimal compression time and reasonable compression). By default ripped audio files are placed in the Music folder saved under Artist\Album\Track Number Artist - Title this option could be changed to suit using Set next to	Naming. EBU R128 is a new form of Replaygain calculation, if ripping to an Apple format enable the iTunNORM tag option to write in a format iTunes can use. Depending upon which audio player is used, if the player can handle 24 bit audio files, then adding the DSP effect HDCD is useful, in that any HDCD audio CDs (a special encoded audio CD with 20 bits of encoded audio information) will be detected and encoded to a 24 bit audio file, non HDCDs are left at 16 bit. [Advanced option] If your CD drive supports reading into the lead / lead out, check the option Read into Lead-in or Lead-out (most CD drives do not support this). CD drives have a fixed offset, later in this guide the offset of the drive is found, for drives with a + offset the CD drive would have to be able to read into the Lead-out, where a drive with a - offset would have to read into the Lead-in. By over-reading (if the drive is capable) the first or last few samples can be read from the CD, in most instances these samples are silence. 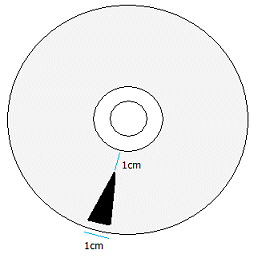 Visit www.daefeatures.co.uk to determine the status of your CD drive. 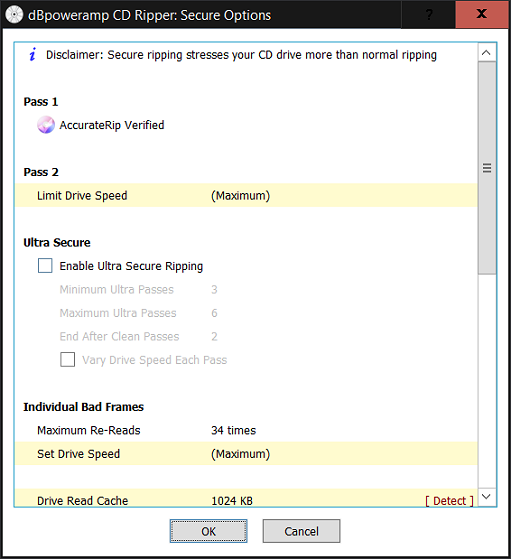 The settings for Ultra Secure depend on your CD drives ability to report C2 error pointers (C2 pointers tell CD Ripper when a section of audio has errors). Place this CD in your CD drive and click Detect c2 Support, if your drive supports C2 pointers it will detect by the end of the disc - noting if a c2 pointer error is signaled right at the start then the cd drive might not be compatible (the above black marker test would signal a c2 error about 1/4 of the way through the test). For a secure ripper to work correctly the cache must be invalidated, this is normally done by reading an area larger than the drives cache, by default CD ripper sets a 1024KB cache. The cache can be detected (it is likely to be much much smaller than the default value). Detecting cache size is quite difficult, it is recommended that 3 or 4 different unscratched CDs are used to detect the value. A 'no brainer' and safe option is to leave the cache as 1024KB. Clear Read Cache with FUA is an option which can quickly clear the cache, it should only be used on compatible Plextor drives (the older true Plextors), there is an option to test for this feature. 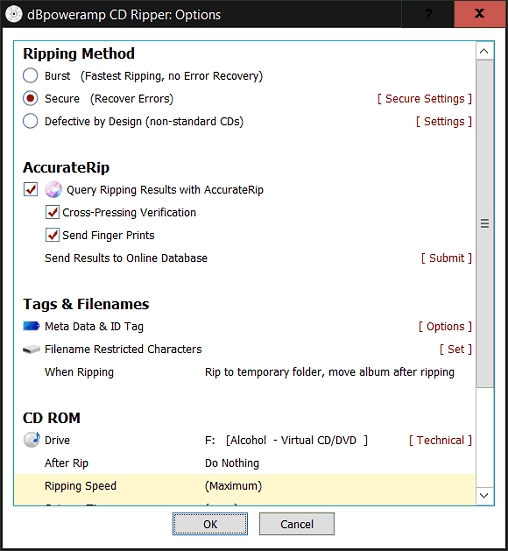 The Secure Rip Abort options will end ripping early if the disc is badly damaged, this is important as a secure ripper can sometimes try too much to recover a damaged disc, sometimes spending 2 hours on one disc, which is not overly healthy for a CD drive. A Secure Extraction Log is used to save details (to a text file) of all actions taken on a disc (which tracks had errors, where the errors were), noting that Log Filename is left as the default value. The log file is saved to the Music Folder as a text file. Maximum Re-Reads control how many times a 'bad' section is retried, with C2 pointer support this can be set to a higher number, such as 60. Without C2 support it is not recommended that this value be increased, as there is more of a chance of a consistent error getting through ripping. 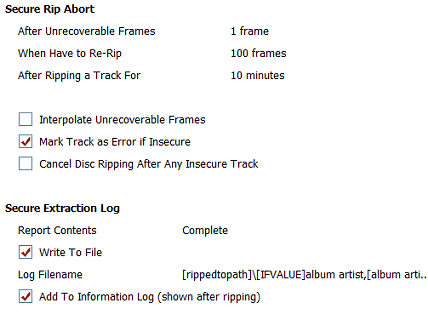 When AccurateRip is operating it will report a message next to a track such as 'Accurate (12)': this reports your rip matched 12 other peoples rips (the confidence number), anything above a confidence of 1 can be relied upon. On a damaged track the report might be 'Inaccurate (2)', where your rip disagrees with two other peoples Rips. If all the tracks dis-agree with AccurateRip then it is likely your CD is a different pressing to the one in AccurateRip's database. If the track names are wrong, or require correction, press ALT + M (or click Metadata Icon on the tool bar) to activate the PerfectMeta review page, clicking on a different provider (buttons at the top) uses all the data from that provider, or clicking on a single item shown will use that item. Missing album art can be added quickly by clicking on the art image. By default CD Ripper will embed album art inside each ripped audio file (audio format permitting) and also write a Folder.jpg file to the location of the album.